Scientists using a camera designed and operated at Arizona State University's Mars Space Flight Facility have discovered the first evidence for deposits of chloride minerals - salts - in numerous places on Mars. 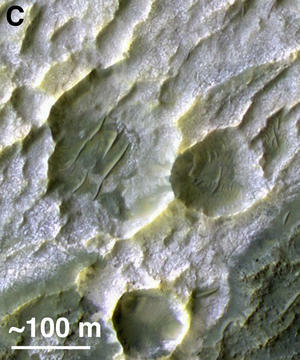 These deposits, say the scientists, show where water was once abundant and may also provide evidence for the existence of former Martian life. A team of scientists led by Mikki Osterloo, of the University of Hawaii, used data from the Thermal Emission Imaging System (THEMIS) on NASA's Mars Odyssey orbiter to discover and map the Martian chloride deposits. The Jet Propulsion Laboratory in Pasadena, Calif., manages the Mars Odyssey mission for NASA's Science Mission Directorate. Developed at Arizona State University, THEMIS is a multi-wavelength camera that takes images in five visual bands and 10 infrared ones. 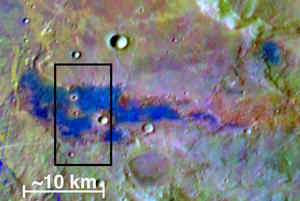 At infrared wavelengths, the smallest details THEMIS can see on the Martian surface are 330 feet (100 meters) wide. The scientists found about 200 individual places in the Martian southern hemisphere that show spectral characteristics consistent with chloride minerals. These salt deposits occur in the middle to low latitudes all around the planet within ancient, heavily cratered terrain. The team's report appears in the March 21, 2008 issue of the scientific journal Science. Besides Osterloo, the team includes Philip Christensen, Joshua Bandfield, and Alice Baldridge of Arizona State University's Mars Space Flight Facility; Victoria Hamilton and Scott Anderson of the University of Hawaii; Timothy Glotch of Stony Brook University; and Livio Tornabene of the University of Arizona. 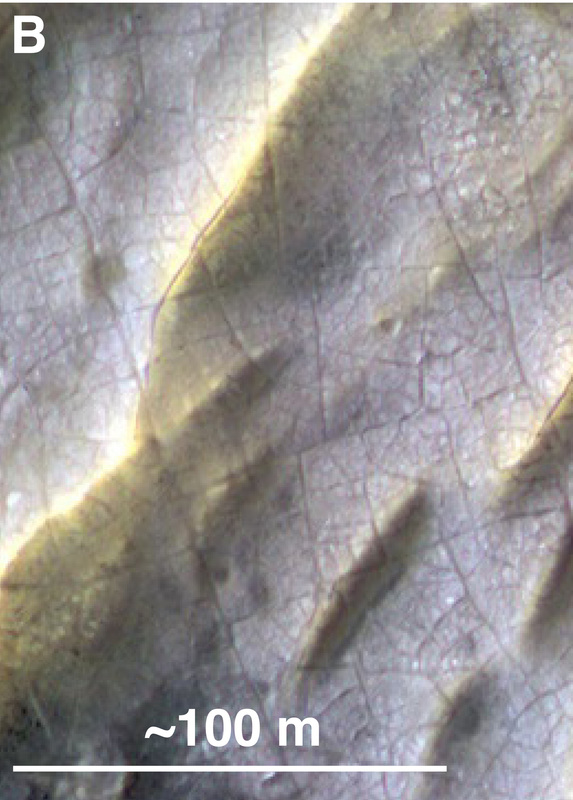 Osterloo found the sites by looking through thousands of THEMIS images processed to reveal, in false colors, compositional differences on the Martian surface. As she explains, "I started noting these sites because they showed up bright blue in one set of images, green in a second set, and yellow-orange in a third." Says team member Christensen, "THEMIS gives us a good look at the thermal infrared, the best part of the spectrum for identifying salt minerals by remote sensing from orbit." When plotted on a global map of Mars, the chloride sites appeared only in the southern highlands, the most ancient rocks on Mars. Christensen goes on to characterize the sites' geological setting. "Many of the deposits lie in basins with channels leading into them," he says. "This is the kind of feature, like salt-pan deposits on Earth, that's consistent with water flowing in over a long time." Christensen, a Regents' Professor of Geological Sciences at ASU's School of Earth and Space Exploration in the College of Liberal Arts and Sciences, designed THEMIS and is the instrument's principal investigator. Osterloo notes, "The deposits range in area from about one square kilometer to about 25 square kilometers," or about 0.4 square mile to about 10 square miles. She adds, "Because the deposits appear to be disconnected from each other, we don't think they all came from one big, global body of surface water." Instead, she says, "They could come from groundwater reaching the surface in low spots. The water would evaporate and leave mineral deposits, which build up over years." The scientists think the salt deposits formed mostly in the middle to late Noachian epoch, a time that researchers have dated to about 3.9 to 3.5 billion years ago. Several lines of evidence suggest that Mars then had intermittent periods of substantially wetter and warmer conditions than today's dry, frigid climate. Up to now, scientists looking for evidence of past life on Mars have focused mainly on a handful of places that show evidence of clay or sulfate minerals. The reasoning is that clays indicate weathering by water and that sulfates may form by water evaporation. The new research, however, suggests an alternative mineral target to explore for biological remains. Says Christensen, "By their nature, salt deposits point to a lot of water, which could potentially remain standing in pools as it evaporates." That's crucial, he says. "For life, it's all about a habitat that endures for some time." There may also be a concentrating effect, Christensen adds. "The deposits lie in what are probably sedimentary basins. If you look upstream, you might find only a trace of organic materials because they're thinly dispersed." But over a long period of time, he explains, "The water flowing into a basin can concentrate the organic materials and they could be well preserved in the salt." Whether or not the Red Planet ever had life is the biggest scientific question driving Mars research. On Earth, salt has proven remarkably good at preserving organic material. For example, bacteria have been revived in the laboratory after being preserved in salt deposits for millions of years. NASA is currently studying potential landing sites for its Mars Science Laboratory (MSL), a new-generation rover due for launch in fall 2011. Sites featuring clay deposits number heavily in the short-list of candidate places to send the rover. Christensen says, "Scientists have studied Martian clay mineral sites for years now, and it's natural they should be considered as targets for the Mars Science Laboratory rover. However, the discovery of chloride minerals in topographic basins within the oldest rocks on Mars should also be considered as an alternative mineralogy for MSL or future rovers to explore." "This discovery demonstrates the continuing value of the Odyssey science mission, now entering its seventh year," says Jeffrey Plaut, Odyssey project scientist at the Jet Propulsion Laboratory. "The more we look at Mars, the more fascinating a place it becomes." With colors close to its natural appearance, the chloride mineral deposit looks bright in tone, like salt pans on Earth. The deposit seems to be emerging as overlying material erodes away. Inset boxes show two areas (below) in greater detail, revealing cracks that formed as the salt deposit dried. One kilometer equals 0.6 mile and 100 meters is 110 yards.